We leave Mae Sot on the 11th November having spent a day lazing at our cheap but very comfortable $20 a night motel. Over the last 36 hours, we have gradually said goodbye to the whole group as each one or two go their separate ways. We get our clothes washed, clean the very muddy bikes and do some basic maintenance. Streak is not well so we decide to take the easy road to Chiang Mai. We had originally intended doing the journey in 2 days but the road is so good, we are only 150kms out Chiang Mai at one point when we keep going so that we can take Streak to BMW as soon as possible. I check online whether the guesthouse I had selected for the next few nights is available tonight and quickly book an extra night. 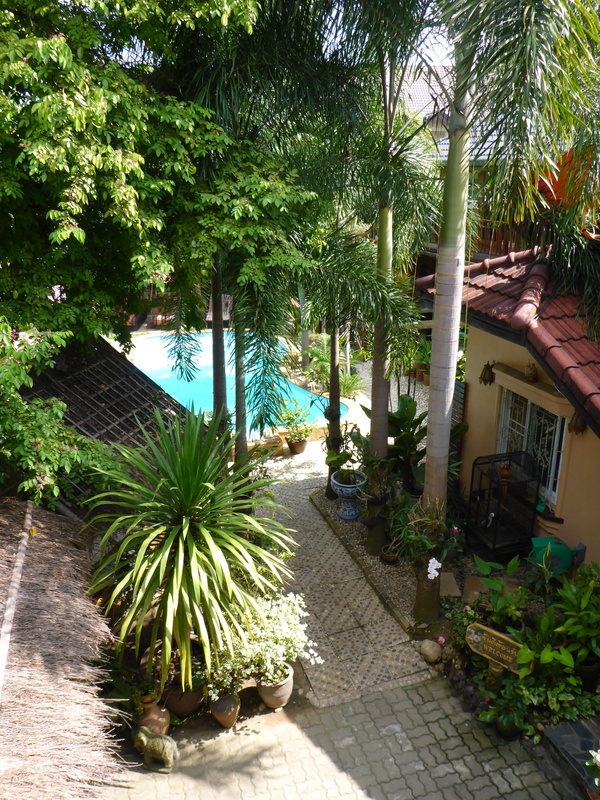 We get to our guesthouse, Liam’s Suan Dok Mai and feel like we have arrived a friends’ home. 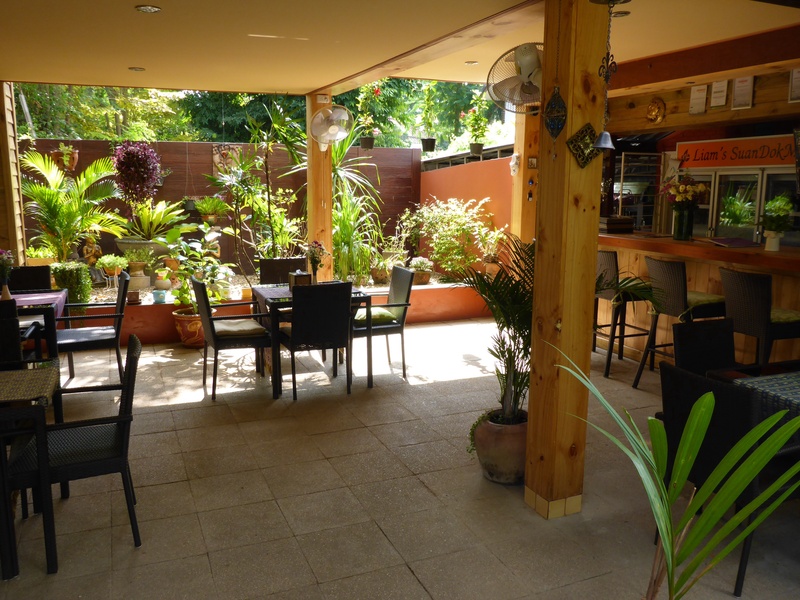 It is a little oasis of lush gardens, friendly open air restaurant and the hosts are very welcoming. The room we get is beautiful. It will be nice to relax and recharge here for a few days. So we have been here since the 11th November. We quickly and easily settle into a relaxed mode. Everything here is so easy and civilized. Everything works!! No power cuts. No cold showers. No noisy generators. No smelly bathrooms. No noisy hooting cars. No potholes in the streets. The internet and our 3G sim card work. The guesthouse owners speak excellent English (they are Dutch and Belgian). They understand our needs and how they can help us get what we need. In fact they are incredible helpful. One morning he gives us about 10 sheets of paper he has printed off for us with motorcycle diagrams and part numbers. The guesthouse also has a pool and a restaurant. Not far by tuk-tuk (3 wheeled motorcycle taxi) is a huge shopping centre where we went and got our first 4D experience movie! The seats move in all directions, there a puffs of air coming from your seat and can even get splashed. Lucky I noticed the ‘water on’ sign on our arm rests before the shorts started!! We sort our bags and ship a box of paperwork home. We feel like taking a leisurely pace and making the most of this comfortable guesthouse on the outskirts of Chiang Mai. BMW were slow at identifying the problem. When we returned 2 days later and I rode Streak again, I felt no difference. What have they done and why can’t feel it is still not right I wonder?! 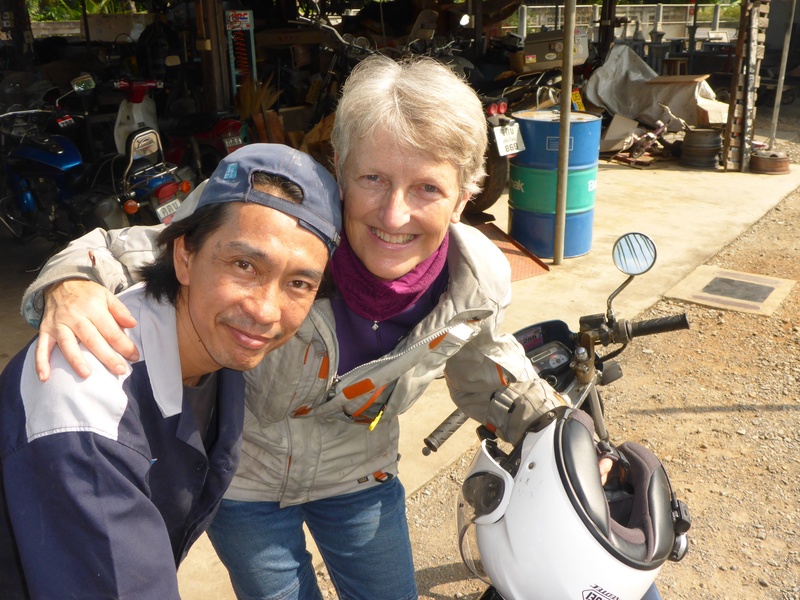 Because, although the mechanic knew we had travelled from the UK, I explained the problem, how Streak died on me on a hairpin bends or ‘coughs’ when I open the throttle when overtaking or changing gear, he couldn’t feel the problem because, in his own words ‘I thought you are a lady so I ride it slowly and open the throttle slowly’. Seriously?!…. Only when I ask him to ride it again himself and open the throttle does he understand. Problem identified by swapping some parts and now the replacement part is on its way to Chiang Mai. 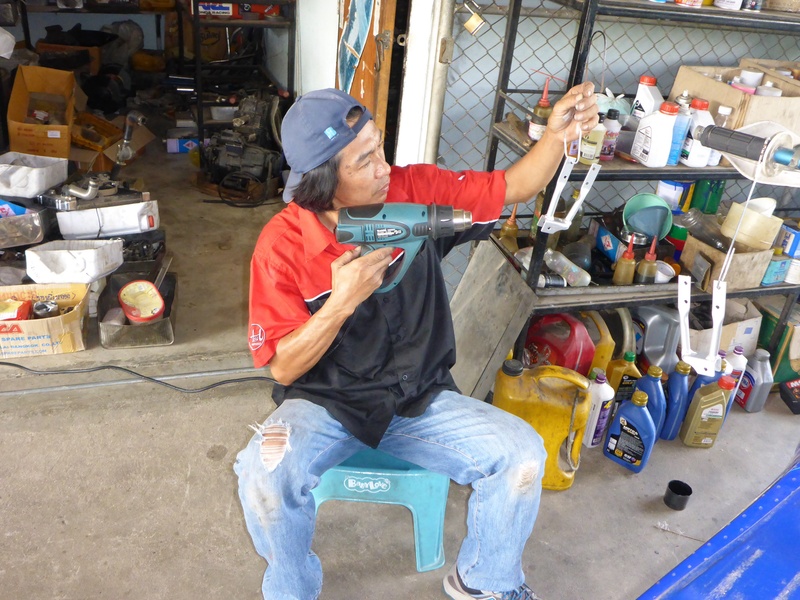 In the meantime, Anthony goes with Micheal, whom we met in Myanmar, to meet his fix-anything mechanic to see what he can do with my smashed brake fluid reservoir, while I go to the dentist. As of 17th November, the part has not arrived yet, Streak is getting a makeover with a new reservoir casing being made and some highway pegs fitted, we haven’t organised vehicle insurance yet, we haven’t found out about the roads in Laos so haven’t got our route planned at all, will we even have time for Laos now? Anthony is having his second visit to get a new inlay after he cracked his tooth in Iran, so we are here for another couple of days. 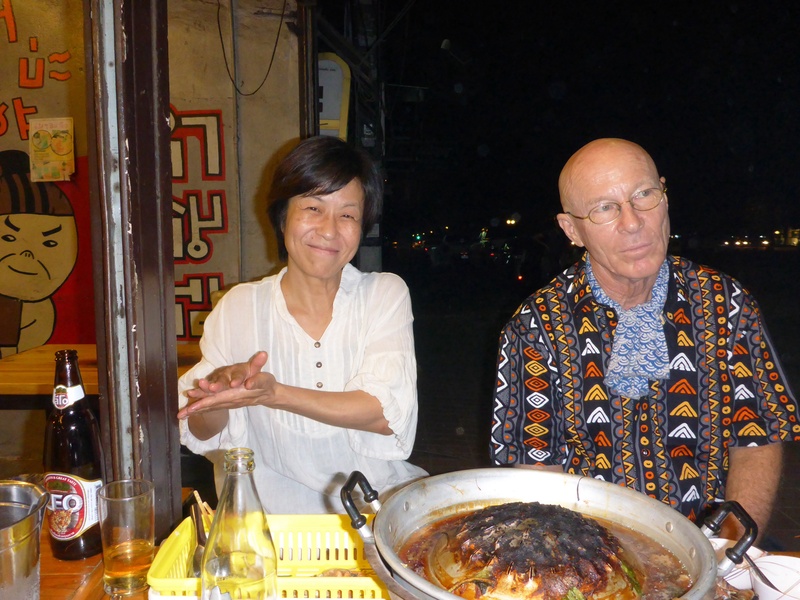 Time then for a massage, catch up with Ian from our Myanmar group and another dinner with Micheal and his wife Atsuko. We also have to work on our next bike shipment before we get to Kuala Lumpur. We are now wondering whether we shouldn’t find a friendly place to park the bikes for a month and fly back to KL on our way to South America and organise the shipment then. As we had to enter Thailand on the same passport as we left Myanmar on, that is our Australian one, we only got a 15 day visa. 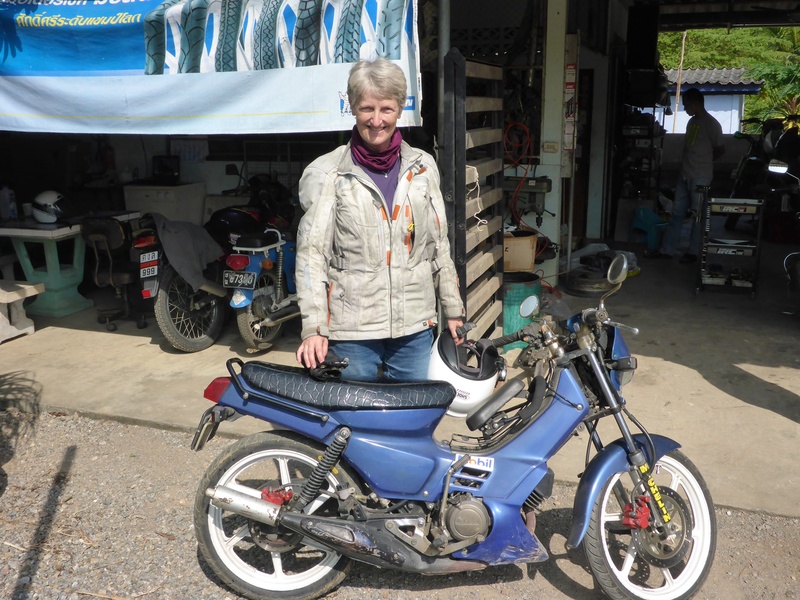 We will have to dash to Laos when we leave Chiang Mai – which route shall we take though?? Streak is all fixed up!!!!! Nung has done such a brilliant job – I am very happy. He built a metal plate to fit my broken number plate on. It is a work of art – the way he filed and smoothed the steel plate around the original fancy curved UK shape. 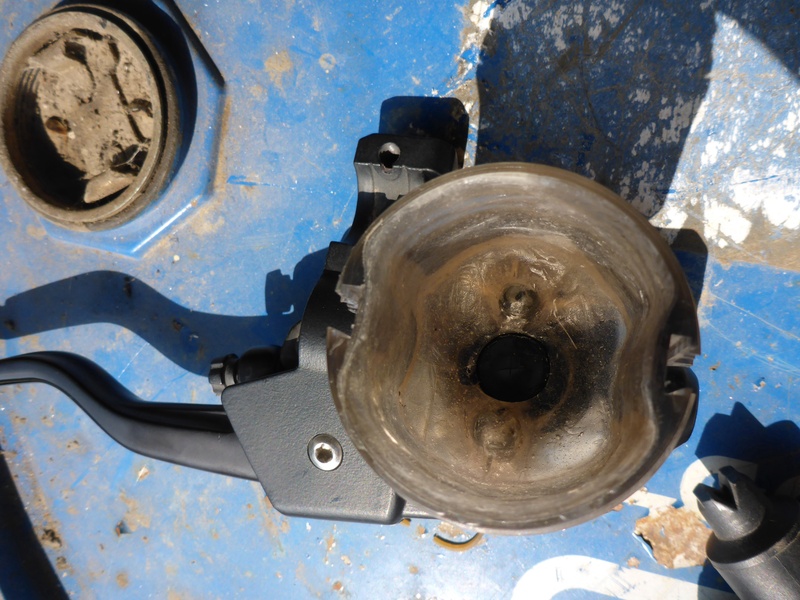 He created a double layer casing for my brake fluid reservoir – one in resin and an extra fiber glass one. 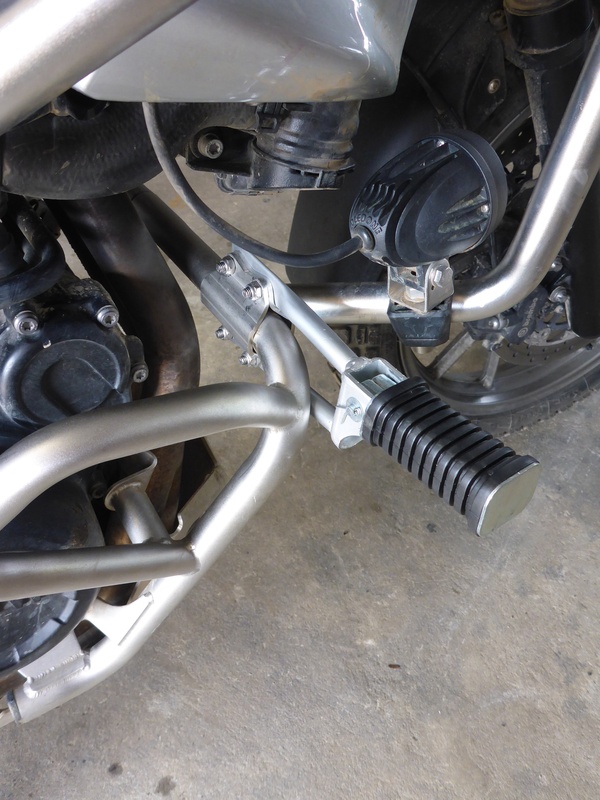 And he built then powder coated brackets for some highway pegs I wanted so that I can stretch my arthritic knees occasionally. All that for $100. And the BMW part arrived and fitted – warranty job. We have simply lived for the past 10 days here and have not done one single touristy activity, much to the surprise of other guests we get to meet over our stay. What has struck us is how easy and cheap everything is here. As I mentioned earlier, everything works. The roads are in great condition. There are large supermarkets and shopping centres and still many small markets all over and tiny stalls selling all sorts of goods and food stalls. It feels like a wonderful mixture of ‘western’ 1st world and 3rd world. We still sense the tolerant nature of people which had struck us 28 years ago. The drivers and motorcycle riders mostly follow road rules. Driving is easy. There is very very little hooting and there is, in the city at least, good anticipation and tolerance of what drivers are about to do. They never look or stop before pullingnout, but everyone expects and anticipates that, so it all works and flows nicely. Sadly, there are the odd impatient and crazy drivers and a lot of drink driving making Thailand one of the most dangerous country in the world for drivers. As a country, they seem to have adopted many of the clever and useful road markings we’ve seen elsewhere in the world: road lines are different colours on the edge and when separating lanes like in the US – that way you know whether you are on a single way or 2 way road. There are boxes painted at intersections like in the UK so that cars does not block traffic – and drivers respect this rule unlike in Brisbane. There are separate lanes at large intersections for U turns like in the US so you don’t end up waiting at 2 sets of lights. Turn off and turn on lanes on dual carriage ways are separate so you don’t end up with a dangerous short section of road where everyone is cutting in front of others before the extra on/off lane disappears. And the have lovely trimmed bushes and colourful bougainvillias dividing dual carriage ways, like back home in Oz. You can get good and cheap quality everything here – not just cheap poor quality imports. Spare parts, tools, medication and labour are incredibly cheap. The dentist was a quarter of the price we’d pay in Australia, spare parts 1/10th of the cost. Labour is still incredibly cheap. And good, fresh and healthy food even cheaper, everywhere. The biggest change we’ve noticed is the number of cars! We used to see few cars, many bicycles and scooters. Now we see mostly cars, many scooters and motorcycles and very few bicycles. Tuk-tuks are still everywhere providing excellent taxi service. So the pace has changed. This makes walking in many places difficult as the streets do not cater for pedestrians. We meet many people from Australia, America, France even who spend 6 months of the year here and many who came here for 12 months 3, 4, or more years ago! We definitely understand the appeal of living here… We have connected with a few people here, organised a few dinners and drinks out, don’t have enough time left now to accept some invitations and suddenly we feel like we have a circle of friends here. As we have simply lived while in Chiang Mai, our thoughts of going home come up often, initially for the one month before heading to South America, but then when we eventually get home after our world tour. Maybe this is one of the reasons we have felt quite drained and lethargic here. So many thoughts… So many questions… What will it be like for us going home, how will we find it, how will we fill our days, will we be content again at home, what about our friends, will there be the same connection between us, will we find we have become irrelevant to their lives, will we still enjoy living in Manly or will we seek a smaller community where people connect more, will we try and organise house swaps while we continue our trip, will we manage to cull all our surplus ‘stuff’ once home as we have promised ourselves, how will we eventually settle into retirement – and what odd jobs will we be doing to replenish our coffers and enable us to keep returning to visit family in Europe. Will we reconnect with our bikes in Santiago and ride up the west coast of South America or Sao Paulo and find ourselves a boat to ride the Amazon? So many questions… But what we do know is that we are looking forward to being home for a while and catching up with friends. People here keep asking what our route is from here. We have no idea. We really have none. And I love that. I do know that I do not fancy challenging dirt roads for a while though!! So we will opt for small but tarred roads, taking us through quiet villages so that we can enjoy Thai, then Laos village life. First we will head towards a place called Nan!! Good luck for the next leg of your travels. love from us both. Loving the blog guys. Keep living life to the full! Well done to both of you. Very good friends of mine retired to where are now and loved it for around 6 years and then they decided they needed another challenge …. So they went and lived in Mongolia of all places. Such a big world and so little time eh? So keep moving. Looking forward to catching up sometime soon. Sounds like you are going to need time to process properly everything that you have experienced. A bit of overload perhaps? Take the time until you are ready to leave again. There will be answers to all the questions you are asking yourself given time. Also allow yourself the flexibility to say no to the next leg of your trip. You don’t HAVE to go to Laos. Maybe you just need to go home for a little longer than planned. After all, it is hard to imagine what home is like from a distance and after all that you have been through, just like you already hinted in the blog. Enjoy life just like you have been doing to this point. Looking forward to catching up albeit probably only briefly:-) much love, Jan and Ineke.. Your blog is absolutely fantastic, it takes me to most wonderful places as I sit here and what is increasingly becoming a boring life compared to yours. I’m really looking forward to catching up with you when you come back, you have so many wonderful tales to tell of the places you have been. Stay safe, have fun and keep writing the blog!